Being a mom has made come to terms with the fact that I will most likely be sporting a backpack at one point or another, and I think I'm okay with it. I will do almost anything to free up both of my arms / save them from any extra weight, since I will have 2 little boys under 2. I'm even more okay with the idea of a backpack diaper bag when they are all as cute as these ones above, but I'm having such a hard time deciding which I like best! Also, my plan is to get a fun kids backpack to keep most of Camden's things (diapers, change of clothes, etc.) that will stay in my car at all times. That way I won't need room for ALL of his stuff (maybe just his sippy cup/snacks?) along with baby brothers in this one bag alone. Has anyone done this and actually succeeded? I have high hopes! ha. 2. Ju-Ju-Be Legacy Be Right Back: This is the bag I've heard the most rave reviews about. Everyone seems to love their Ju-Ju-Be! Is it worth the price? Yes? No? I'm undecided, but I really, really like the fun (and neutral) pattern, the overall features it has, and since there is so much hype about it that makes me believe it is a great option. 3. Herschel Supply Co. Dawson Backpack: Navy and stripes. I repeat, navy and stripes! Right up my alley with this one based on looks alone, and it seems to be a really great size. The downside to this one is obvious - it's canvas. Sooo hard to keep clean! Good price, though. Alright girls, give me your vote! 1, 2, 3, or 4? Not to add another option but here's one that I recently ordered for my baby that's due in a couple days. http://storq.com/products/carryall I haven't used it yet other than packing it up for the hospital but I love it! Backpacks are definitely the way to go! I have the nylon marc jacobs backpack that I love! I like 1 and 2 of your choices! I think the buckle on the third one would be a pain :) Have a great weekend!!!! I got that exact JuJuBe one! I have yet to actually use it, but I love it! I'll have a better review in the coming weeks when little man actually makes his arrival! I have also been contemplating the backpack diaper bag option and think it will be the most functional for sure! I have been looking at that black skip hop one, but love that fun kate spade one! 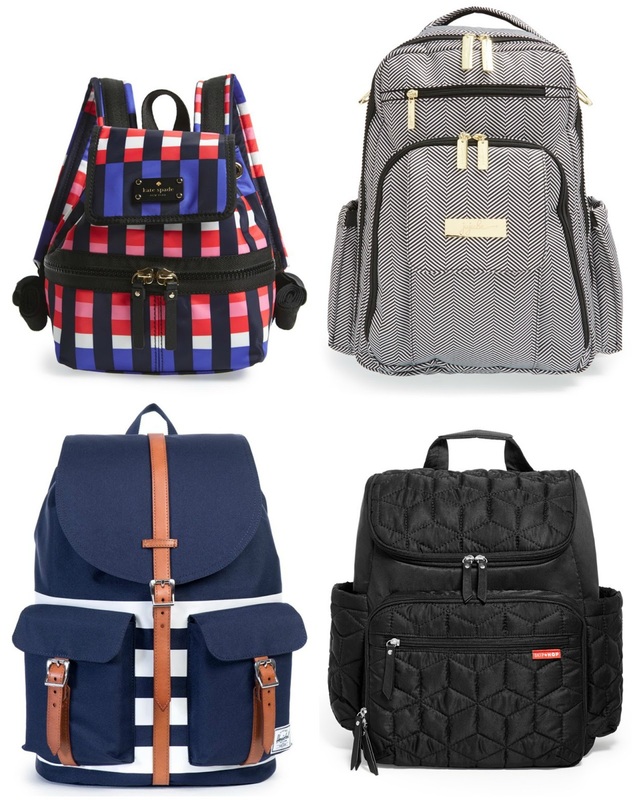 I'm glad there are so many cute options for back pack diaper bags! Definitley the JuJuBee but second fav would be the SkipHop. Not to add another one to your list, but I am in love with the Lily-Jade backpack diaper bags. I am trying to decide which one I want, I'm in between the Meggan and Elizabeth. For yours I like #4! I have a diaper bag backpack just for Olivia...I love it. I have the JuJuBee BFF and it holsd a lot of stuff. I'm really glad that I got it. What did you have just for Camden? We have #4 and it works great!! Holds up a bunch and the two inner compartments it comes with keep it organized pretty nicely! A friend with two little guys has the Ju Ju Be convertible backpack and I love it! I already got a different bag though so I'm just waiting on a sale to justify buying it lol. Also when my daughter was little she called a toddler backpack with a few toys and change of clothes etc to lighten my purse/bag. It made her feel like a big girl too so it was a win win. 2 is gorgeous! I have the tote version of 4 and I love it and I'm not paranoid about it getting beat up because the material is so durable and the price is right! Which one did you decide to go with?